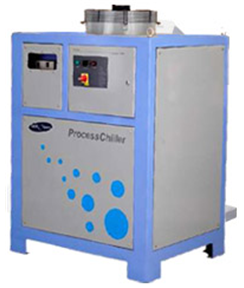 ACU Series Packaged Water Chillers are designed to meet diversified process cooling requirements of the Modern Industry, meant to enhance productivity & quality. They are equipped with the latest safety features and microprocessor controls and easy to handle and maintain. PHE (Plate heat exchanger) Evaporator. Large size inbuilt insulated tank for local dedicated cooling. Shell &Tube / Large size finned condenser. Anti freeze, dry running protection etc. Audio Visual Alarm against operational failure to draw attention. Easy access for internal components maintenance. Filter dryer to ensure moisture free system. Low switching frequency of compressor by intelligent program. Fault indication with audio alarm. Hot and cold well tank’s External. Simplex / Duplex water filters. Extra large chilled water buffer tanks. Auto, PC compatible Data loggers. Automatic water make up device. High Flow rates model are available.